Trails don't build themselves. But with the ongoing work of dedicated volunteers, Kimberley already has an amazing network of trails. You can help out by donating your valuable time, or your hard-earned cash. ﻿﻿By becoming a member, you will help us build our network of trail users, which is critically important to establish trail usage levels whick supports our efforts at securing grants for trails. KTS is a non-profit society, and all money goes to trail building and maintenance, and KTS administration. This is the first step to supporting Kimberly Trails. Please become a member today and we will add you to our newsletter list to keep you informed about all things trails related. If you're not sure about your current membership status, please email us to ask: info@kimberleytrails.org. Annual trail passes are a tangible and visual way that you can show your support for Kimberley trails. Funds raised directly support trail maintenance by providing food, drink and tools to members of the volunteer trail crew. Trail passes are not mandatory, but they are a critical source of annual funds that directly support trail maintenance. Trails are not free to maintain. Rather donate your time? 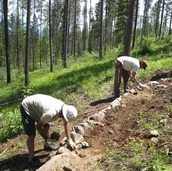 Earn your trail pass by volunteering with our TRAIL CREW for a minimum of 2 hours. See STEP 3 below for details. ​TRAIL CREW is volunteer group of trail users that help maintain the quality of trails in the Kimberley area. Well-maintained trails are safer and more fun, while also helping to attract and maintain trail-based tourism that support our local businesses. - We will announce on FB where specifically we will be working so that you can join if you miss the carpool meeting points outlined above. An integral part of maintaining our trails is active monitoring. Please contact us at admin@kimberleytrails.org and we will assign you 1-2 trails to monitor. The role is critical to maintenance and includes walking, hiking, running, or riding a trail 1-2 times per month (minimum) to see if any trees are down or if any specific maintenance is required. Just visiting our trail systems? Welcome! And if you enjoyed our trails please help us by giving a little trail Karma by clicking the box on the right.